The effort to breathe new life into the Halsted Street commercial district dates back decades. BRIDGEPORT — In Ald. Patrick Daley Thompson's opinion, the 11th Ward — especially along Halsted Street — has more than its fair share of nail salons and massage parlors. "We want there to be a place for people to get a sandwich and have a date night," Thompson said. "We need to create that momentum." To help remedy the situation — which dates back to the mid-1980s — Thompson will ask his colleagues on the City Council this month to force any new businesses that want to open along Halsted Street to get special permission from city officials. 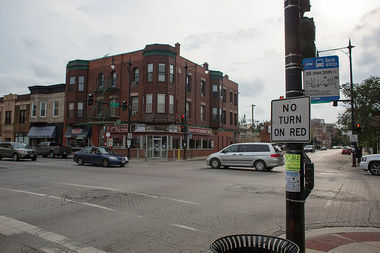 Those changes will make sure residents can have a say in what kind of businesses open along Halsted — and block those that are not in demand, Thompson said. "Restaurants want to cluster," Thompson said, describing his vision for Halsted as a mecca for those heading out for a nice dinner and to see a show or to visit an art gallery. "When a nail salon opens up, it can derail that momentum." While Bridgeport has seen an influx of residents and industrial businesses, shops and stores have not followed, Thompson said, adding that the city needed to step in. Aldermen have the ultimate authority over matters of zoning in their own wards, and often change the rules governing parcels that are the subject of controversy. Ald. Leslie Hairston (7th) dropped a similar plan last month designed to block new convenience stores, nail shops and beauty supply stores from locating on 71st Street after a raucous ward meeting where residents expressed concerns that the move would block desired businesses and lower property values. If approved by the City Council, the zoning change will not affect existing businesses, Thompson said. A $3.8 million streetscaping program designed to slow traffic along Morgan Street from 31st to 35th streets, is expected to be completed this summer, officials said. Halsted Street will also be repaved in the coming months after new water and sewer pipes are in place.